For some shooters, heavy recoil and muzzle blast can turn the thrill of the hunt into the pain of the hunt. Hornady Custom Lite is a welcome development that lets these sportsmen (and women) enjoy full-power rifles with less punishing cartridge loads. 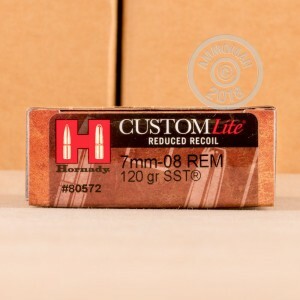 This 7mm-08 version of the Hornady Custom Lite series fires a 120 grain SST polymer-tipped hollow point bullet at 2,675 feet per second out of the muzzle. This precision-engineered projectile delivers great accuracy at extended ranges while retaining the terminal performance necessary to bring down game. This superior performance allows the cartridge to be downloaded somewhat without materially undercutting its capabilities. 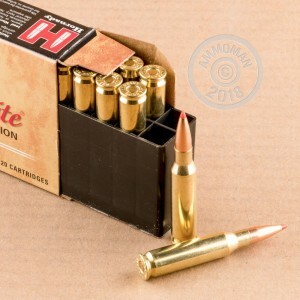 These cartridges come in 20 round boxes and use non-corrosive Boxer primers and brass cases. Grab $99 or more in a single order at AmmoMan.com to receive free shipping!